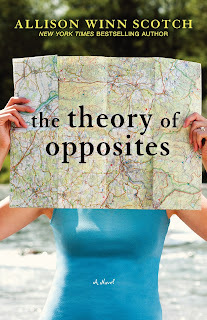 Two things stood out to me with Allison Winn Scotch's fifth novel, The Theory of Opposites. The first is the striking cover, with its colors and the map covering the woman's face. Next is the word "theory," because it makes me think of The Big Bang Theory and I love that show. This novel is NOT about four geeks dishing about Star Trek and going to the comic book store. However, the premise is interesting and thought-provoking! I don’t regularly think about fate unless something comes up to make me wonder how it all came to be. The events that unfolded which allowed me to meet my husband definitely seem like an act of fate. However, The Theory of Opposites makes me question my involvement in this act. I figured that if we were truly meant to be together, we’d meet in some way or another. However, a single sentence I uttered on a cold February night outside of a Chicago bar was the final catalyst in bringing us together. It allows me to believe that if you say whatever is on your mind, it could lead to a life-changing experience. It also makes me wonder if the two concepts of the book work in a yin-yang sort of fashion, like you can’t have one without the other. Like even if you do something to affect the outcome of your life, what happens from that point on is still meant to be and out of your control. There was a line in the new Wally Lamb book [I’m currently reading] that talks about how life hands you cards, but you’re the one who shuffles the deck. So even if life has certain things in store for us, it’s up to us to manipulate what we are given to our own liking. As you can see, this novel can lead to thought provoking discussions about fate. Allison Winn Scotch’s first self-published novel displays her writing talent in many ways. All of the characters are interesting in their own ways and the relationships between them are made clear through strong and realistic dialogue. The use of description isn’t overwhelming and allows readers to easily visualize people and places throughout the story. Allison uses a tongue-in-cheek humorous approach to her writing. It’s more sarcastic than slapstick in nature. The juxtaposition of e-mail and social media within the story works well and doesn’t take away from the narrative. That is also where a lot of the humor comes into play. I find it interesting that Allison’s previous two novels involved complex father-daughter relationships and now this one does too. I can’t remember if Time of My Life did and I haven’t read The Department of Lost & Found just yet. Most books I read are about mother-daughter relationships, so this is a less touched-upon realm of chick lit. Given the nature of the story, a lot of psychobabble is going to be evident. However, it made things confusing at times and I had to wonder what the characters were really trying to say. I mentioned in my review for her previous novel that she used the "G word" a lot and she once again uses it a lot in this novel. Aren’t there other swears that could be used in its place? Finally, it didn’t resonate well with me when Willa’s family members called her William. I know it’s her full name and the reasons behind it, but it’s clear that she wants to be called Willa and it seemed weird to hear her be called such a manly name. It didn’t really add much to the story either. The Theory of Opposites is a story that will stick with readers long after they have turned the last page. I still find myself thinking about the main concept. All I know is that it is inspiring me to be fearless and take more risks. Thanks to Get Red PR for the book in exchange for an honest review. They're doing a giveaway along with Allison's interview. I love the cover, and the story plot sounds like one I would enjoy. I love that Jennifer Garner's production company may be making it into a film- makes it sound even more appealing to me. Oh, This is on my shelf to read. Thanks for the review. Looks fresh and fun. Great review :-). I agree, Becky. That would be the best! Love your book recommend, too!